Despite the high hopes of its owners when it went on the air ninety years ago – the station made its debut on Saturday, December 18, 1926 – KYA endured many difficulties early in its life, owing mostly to the economic conditions of the Depression era. KYA was rescued in 1934 by none other than newspaper magnate William Randolph Hearst, who aligned the station with his San Francisco Examiner. 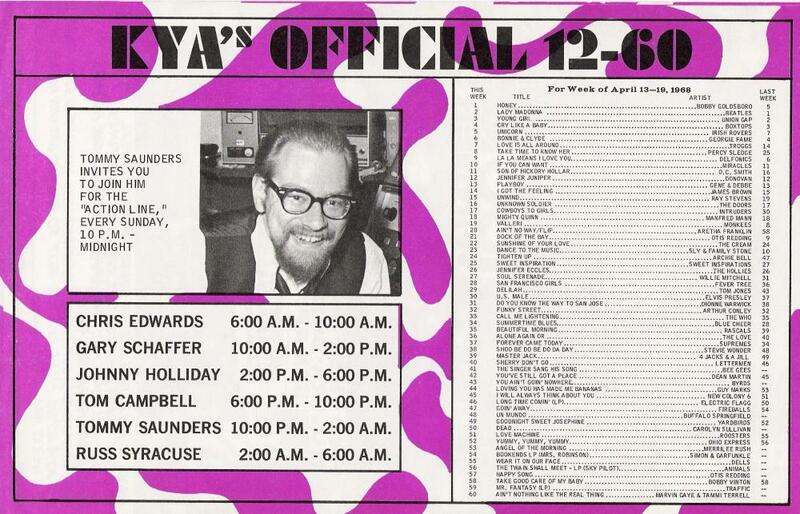 Over the next quarter-century, KYA listeners were treated to a parade of hall of fame-caliber disc jockeys, including Tom Donahue (inducted into the Bay Area Radio Hall of Fame in 2006), Emperor Gene Nelson (BARHOF ’06), Russ “The Moose” Syracuse (BARHOF ’08), Norman Davis (BARHOF ’14), Mike Cleary (BARHOF ’07) and Tom Saunders (BARHOF ’10), as well as Les Crane, Chris Edwards, Johnny Holliday, Tom Campbell, Peter Tripp and “Boss Radio” innovator Bill Drake. KYA can also claim another significant link to pop culture history: fifty years ago, in August 1966, the station promoted and hosted the last live concert performance by The Beatles, at wind-swept Candlestick Park. This entry was posted in Broadcast Legends, Legends Events and tagged in barhof, bill drake, gene nelson, kya, radio, tom donahue.